We're thrilled that director Richard da Costa and dive tech Craig Frederick will be joining us for this screening of Last Breath, and answering audience questions after the film. Join us, and hear more about the production of this thrilling documentary. The heart-stopping true-life story Last Breath, which premiered at the Glasgow Film Festival, is one of those unforgettable films which will have you on the edge of your seat, clutching your friend’s hand, and leaving the cinema glad to be on safe ground. Bringing their years of experience of filming in challenging environments, filmmakers Alex Parkinson and Richard da Costa immerse the viewer in the mysterious and claustrophobic world of saturation diving. "...will leave you literally gasping." At the Huntington oil field, 115 miles east of Peterhead, a routine maintenance dive on a North Sea oil well turned into a fight for survival when a computer error aboard the commercial ship The Topaz sent the boat drifting away from its dive site, dragging along everything attached to it: including commercial diver Chris Lemons. 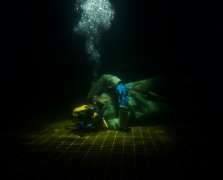 With his diving umbilical cord snagged on an underwater structure and the full weight of the 8,000 tonne ship strained against his lifeline, Chris became stranded on the seabed with only five minutes of breathing gas and rescue 30 minutes away. Told through first-hand accounts, archive and black box footage from the actual incident and pulse-quickening underwater reconstructions, this documentary thriller is all the more powerful if you don’t know the outcome. Resist all temptation to read too much about it beforehand.